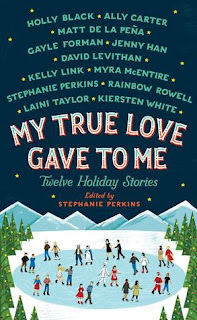 Review: My True Love Gave to Me sports a cover so pretty, I want to frame it and hang it on the wall. Year-round, because I think it’s that awesome. I’m also happy to say that the dozen holiday-themed stories you’ll find beneath that awesome cover are just as charming. I don’t read short story anthologies often; I’m more of a full length novel kind of reader. I couldn’t pass up this collection, though, because it features contributions from some authors whose novels I’ve really enjoyed in the past, like Gayle Forman, David Levithan, Holly Black, and the editor of My True Love Gave to Me, Stephanie Perkins. Gayle Forman’s “What the Hell Have You Done, Sophie Roth?” and Holly Black’s “Krampuslauf” were two of my favorite stories, along with Myra McEntire’s “Beer Buckets and Baby Jesus” and Kelly Link’s “The Lady and the Fox.” I hadn’t read anything by the latter two authors before, but I’m definitely interested in checking out more of their works now. Kelly Link’s “The Lady and the Fox” had a very nice fantasy twist to it, and it wasn’t alone in touching upon the whimsical. These are holiday stories, after all, and is there any time of year that’s more magical than the holiday season? Laini Taylor’s closing story, “The Girl Who Woke the Dreamer,” is pure fantasy, set in a world that could only come from Laini Taylor’s brilliant mind. This tale was unlike anything holiday-related I’d ever read, and I got so swept up in the narrative of young Neve that I wished it had been a novella at the very least because I wasn’t ready to leave its world. Almost every story excelled at drawing you into its characters’ lives quickly and leaving you with a satisfactory sense of resolution within about thirty pages. There were only one or two that I found a little meh, but even those stories still had their moments. Some requisite squealing ensued when Brooklyn, New York and New York University were referenced in not one but two stories (“What the Hell Have You Done, Sophie Roth?” and Matt de la Peña’s “Angels in the Snow”). Overall, this is a winning compilation that’s perfect for reading on a winter night while sipping some hot cocoa. All in All: Look no further than My True Love Gave to Me for a read to put you in a festive mood. It’s a very well-rounded collection that’s sure to warm your heart over and over again.